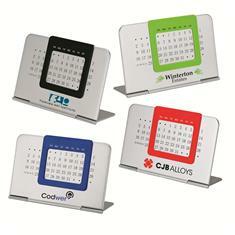 A Perpetual Desk Calendar that can be used year after year. The calendar is made of plastic and features a colorful slide to highlight the year. It is available in your choice of 4 of our most popular colors. A Budget friendly gift that says Thank you! Imprint Area: 2-1/2" x 3/4"